Axon guidance refers to the process by which growing neural axons follow specific, predictable paths to reach their target locations. The tip of the growing axon is known as the growth cone and it is this part of the axon that senses guidance cues (also known as guidance factors) in the surrounding environment. The growth cone receptors respond to the various fixed and diffusible guidance cues and their gradients and respond accordingly. The response is in the form of directional changes in axon growth mediated by cytoskeletal changes. 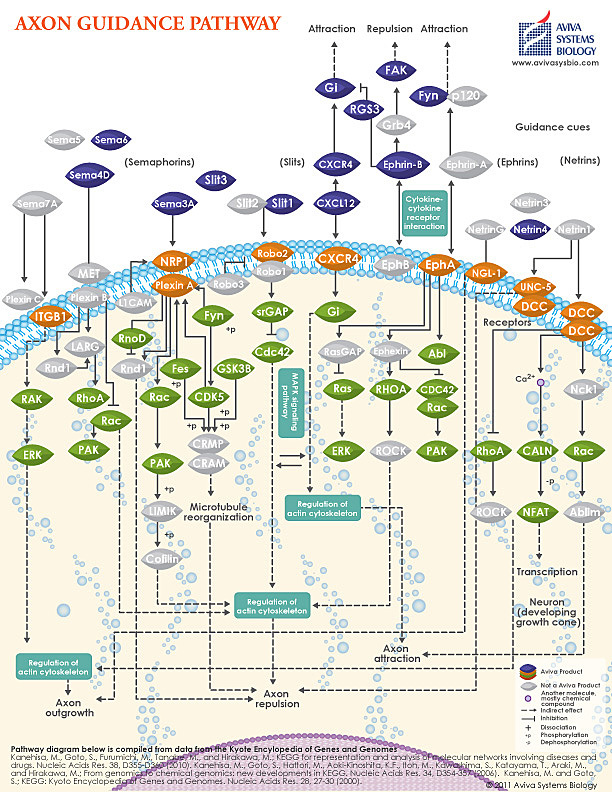 A broad array of signals can function as guidance cues, some of the most well-studied being Netrins, Ephrins and Semaphorins. Each guidance factor serves to attract or repel growth cones during neural development, although different cues can have diverse effects on distinct growth cones. It is the collective influence of the various cues that helps guide axons to their appropriate targets during development. The effects of guidance cues on axon growth can readily be studied in vitro with an array of commercially available factors. Elucidation of the processes that promote and inhibit axon growth during development may provide critical insights into neuroregenerative processes that could benefit patients with spinal cord injuries and other diseases of the nervous system. 1. Harel NY and Strittmatter SM. 2006. Can regenerating axons recapitulate developmental guidance during recovery from spinal cord injury? Nat Rev Neurosci. Aug;7(8):603-16.